New ultra-low power computer is well Fit. Do you have trouble remembering to turn off your PC at the end of the day? No such worries with the Fit-PC 2.0. Using a maximum of just 9 Watts, this tiny computer has a smaller carbon footprint than a low energy bulb. Its manufacturers claim that the Windows XP/Linux box uses 90 per cent less energy than a standard desktop PC. Unsurprisingly, there's a low-power Intel Atom 1.1 or 1.6GHz processor at the heart of the aluminium-clad 1.5x10.1x2.7cm Fit-PC 2.0 - that's smaller than three stacked CD cases. It ships with 1GB RAM. The Fit-PC 2.0 can run either Windows XP or Linux - and should easily be able to handle Windows 7 when it launches in October. It comes with an Ethernet link and six USB 2.0 ports, but you'll have to supply your own monitor, mouse and keyboard. 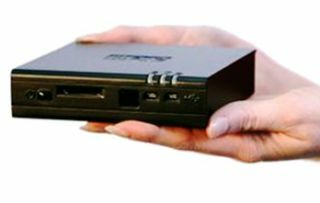 The Fit-PC 2.0 costs from £245 for a discless, 1.1GHZ version, up to £400 for a Windows XP box with 1.6GHZ chip, 160GB hard drive and 802.11g Wi-Fi. More info at www.fit-pc.co.uk.